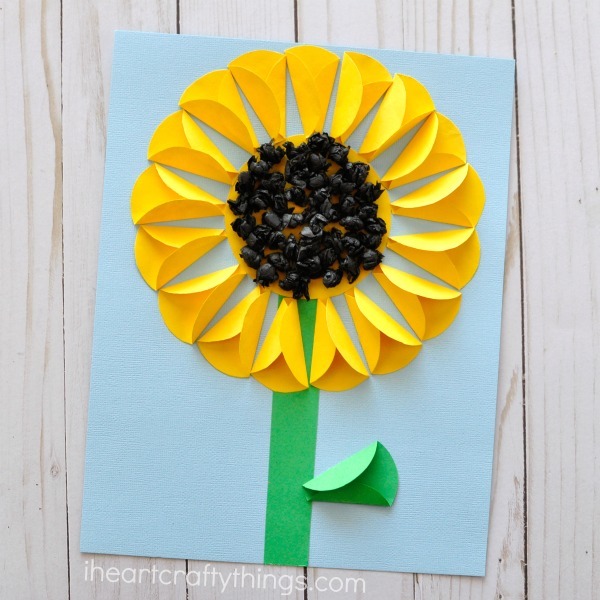 This folded paper sunflower craft is absolutely perfect for a summer time craft. The dimensions created with the folded paper mixed with the tissue paper balls makes this fun paper sunflower craft a show stopper! My heart fluttered with excitement earlier this week when I came across this gorgeous Mother’s Day flower card on Pinterest. 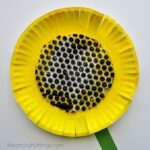 After I saw it I could not wait to create my own variation of it but as a sunflower craft. I love, love sunflowers and every summer I look forward to seeing them in open fields by my open house. 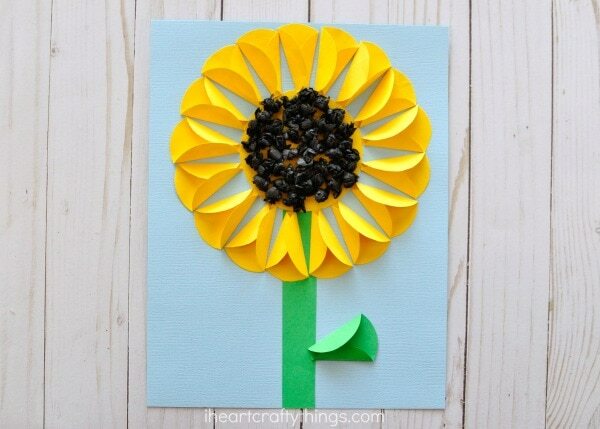 Since they are out in bloom right now, it’s a perfect time to create this beautiful paper sunflower craft. 1. Cut out about 16 2-inch circles out of your yellow construction paper. The easiest way I’ve found to do this is to accordion fold my construction paper 3 times. Trace a 2-inch circle onto the top piece in the accordion fold and then cut out the circle. You should get 4 circles each time you cut. Continue doing this until you have about 16 circles. You might need less or more depending on how you fold your circles. 2. Trace your paper cup onto your leftover yellow construction paper and cut it out. 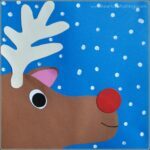 Then cut out a green stem and one more 2-inch circle from your green construction paper. 3. Glue your stem and the large yellow circle onto your light blue cardstock. Fold two sides of your yellow paper circles inward making a smaller point on one end and a rounded end on the other. Once you are finished folding all of your circles, glue them around the yellow circle on your blue cardstock. 4. Fold the green circle the same way as you did the yellow circles and glue it onto the stem for a leaf. 5. Scrunch up a handful of black tissue paper squares into small balls. 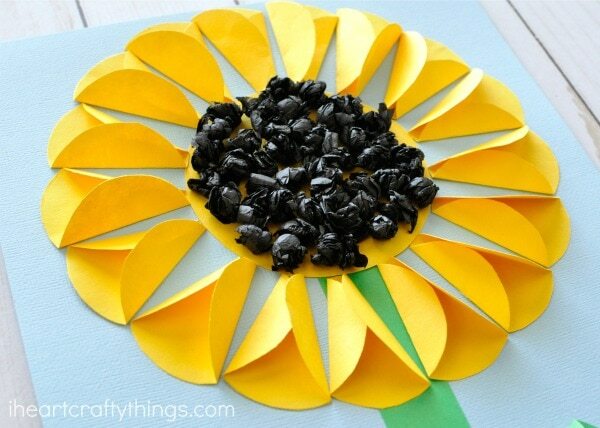 Add glue all over the inside yellow circle of your sunflower craft and add your black tissue paper balls to it. 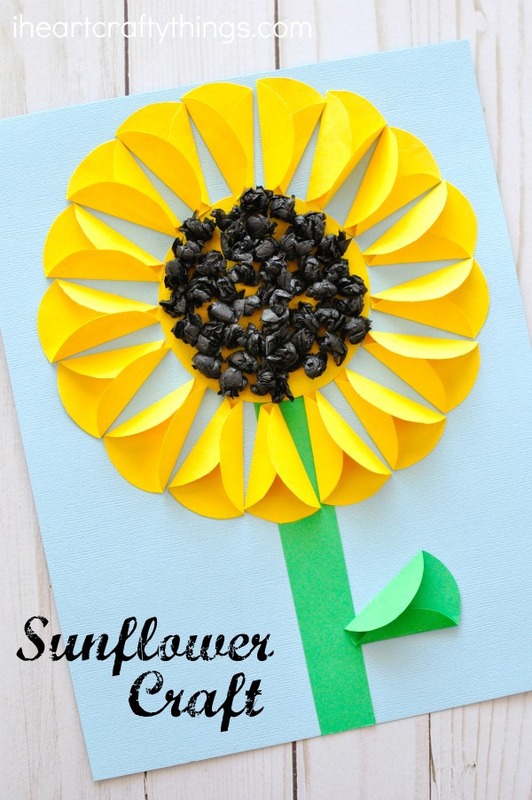 Your Folded Paper Sunflower Craft is finished! Isn’t the 3-D effect of the folded flower petals gorgeous?! If you loved this folded paper sunflower craft you’ll also love these simple paper straw tulips or our pretty hyacinth flower craft. 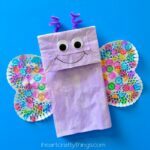 Looking for more summer crafting fun? Check out this dancing jellyfish craft or our gorgeous black glue cactus art. Hey it’s so easy i’ll share it with my daughter she will love it too.Great work!!!! I love ❤️ you crafts. I’ve been using them for the 1st graders that I volunteer to do a art project with.